My name is Brandon Bunner. I am originally from Oakland, California; however, I moved to the bitterly cold city of Chicago to study film at DePaul University. Throughout my time at DePaul I have had to opportunity to explore almost every aspect of filmmaking from screenwriting, directing, cinematography, to sound. As I explored the different fields, I realized my passion was working in post-production. I enjoyed the process of assembling and editing shots together until they begin to form a cohesive story, something about the puzzle-like nature of the entire process appealed to me. As I began to find my niche in the post-production world I found that, while rewarding and satisfying, I started to notice I missed the energy and excitement of working on set. So, when I was given the opportunity to work on set as DIT, as a last-minute replacement, I found another part of the industry I love. Combining post-production attention to detail and on set creative problem solving, being a DIT is both a challenging and stressful position. My first time working as a DIT was on a student project, we were shooting on the Alexa Amira and I really didn’t know what I was doing. I looked up workflows and important aspects of DIT work and by far the most important thing in every article, video, and online tutorial was having a reliable software that can verify file transfers using a checksum. Everywhere I looked I kept seeing ShotPut Pro being recommended and luckily enough for me DePaul had a DIT cart with ShotPut Pro installed on it. DePaul was (and still is) in the process of upgrading their DIT cart, so it was a relatively stripped back setup which consisted of: a late 2013 Mac Pro, a monitor mounted on a VESA arm mount, and that was pretty much it. Now, I had seen people use ShotPut Pro before, but I had never touched it. My first ever experience with ShotPut Pro was on a project I was editing; I came to set one day to check out everything and help with any post-related questions. The DIT on set had some questions for me about how I wanted everything organized and I had a bunch of questions for him about what software he was using and other DIT related questions. 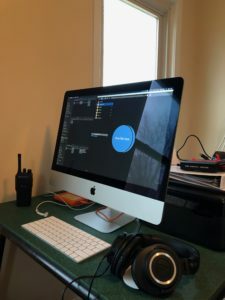 He introduced me to ShotPut Pro and explained its importance when transferring footage–any errors in offloading can mean losing a single file or even a whole card, which can completely derail a production. Since I had very little time before the shoot dates and I had a lot to brush up on, I got started watched some tutorials I found online and the software seemed remarkably user-friendly and straightforward–which is not the case for a lot of cinema related software. Feeling slightly confident, I went into the shoot and began my work. We were shooting a music video for a Chicago rap duo, The Palmer Squares, and the concept was to try and recreate iconic scenes from a selection of famous movies. My workflow was to offload and verify footage using a xxHash checksum and then create proxies. There was also quite a few VFX shots, so I was also doing some test composites on set to ensure we were getting the coverage we needed. As well as some minor live color work to give the DP and director an idea of what a more stylized look might be. Overall the project and shoot went very well and since that shoot I have continued to work on more projects as a DIT and gotten much more comfortable and confident. Recently I was on a crew filming on location in Southern Indiana. 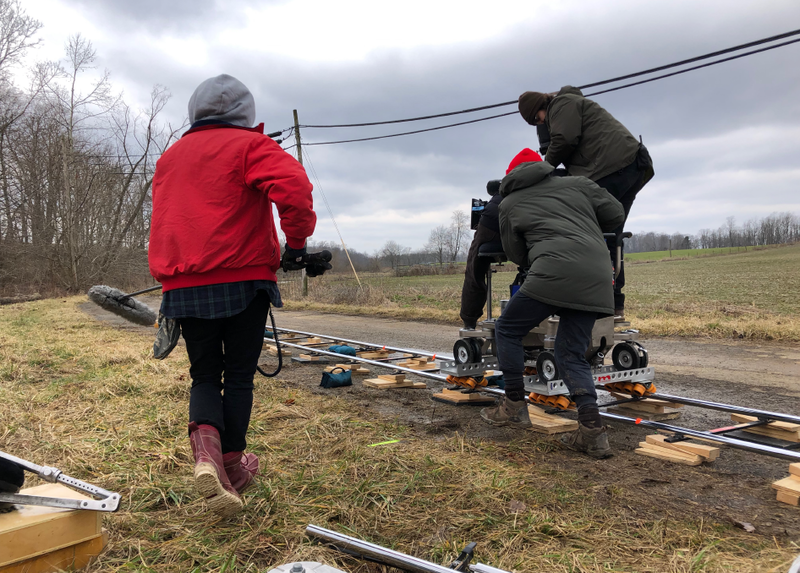 We were shooting on a farm and the film is about a veterinarian student in the heart of America as he struggles to find human connection and understand his own sexuality. For the project, we were shooting on the RED Epic-W and we knew going in that we had a very tight turnaround to submit the film to festivals. So, we recorded proxies in camera to save time on transcoding after offloading. We were shooting 6K footage in REDCODE RAW with 7:1 compression and all of our exterior shots were shot in HDRx, so our offloading and media storage were very important considerations before the shoot. On set, I was offloading cards and then syncing sound and prepping timelines for editorial. We wanted to get as much editorial prep done on set so when the director and I sat down to edit the film we could get started right away. We finished shooting on February 24th and made the long drive home to Chicago, and immediately the next day we began editing to try and make festival deadlines, the first of which being March 11th, only 15 days later. The planning and preparation before the shoot as to how to offload and ensure the safety of our footage was vital. With such a tight turnaround, we did not have any room for error and any mistakes offloading or corruption of the footage would have been a major blow to our production since we would not have time for reshoots or pickups. 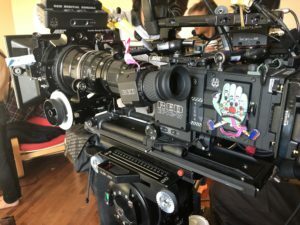 That is where ShotPut Pro came in, and having the flexibility to offload securely and quickly allowed me to get to work much faster and with confidence that the footage was backed up safely. ← New Licensing Options – Rentals and Bundles, oh yeah!